Comprehensive selection of White Turquoise Rings available in Size 10, Size 11, Size 12 and Size 13 including half and quarter sizes for Men and Women showcasing incredible quality of stone in various sizes to fit your personal style. 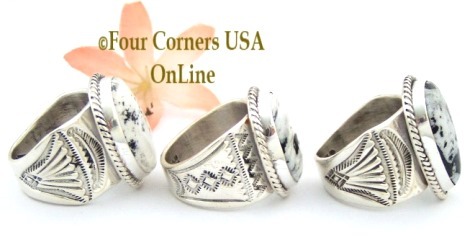 Our larger Size White Turquoise Rings offer a mix from sedate elegance to bold wide shank stamping and currently feature the exceptional craftsmanship of Native American Navajo Artisans Tony Garcia, Freddy Charley, Phillip Sanchez and Walter Vandever. With its unique Black and White coloring, White Buffalo Turquoise offers the wearer an opportunity for an everyday accessory that goes from work to play or elegant evening out. 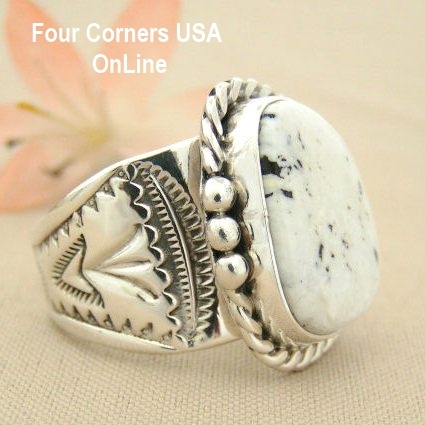 We offer a comprehensive collection of White Buffalo Turquoise Jewelry including White Turquoise Rings listed by size for your convenience.